The Ballet Bag look at how the three creative teams involved have reflected Titian's paintings in different ways. Marianela Nuñez and The Royal Ballet in Diana and Actaeon. Metamorphosis: Titian 2012. © ROH/Johan Persson, 2012. 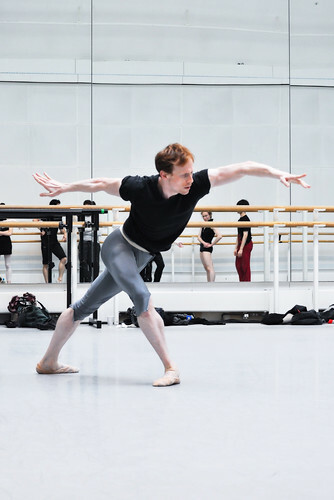 Tonight’s relay of Metamorphosis: Titian 2012 as part of BP Summer Big Screens is a perfect opportunity for audiences to sample the diversity of choreographic talent within the Royal Opera House. Three different creative teams formed by a contemporary artist, a composer plus a pair or a trio of choreographers have produced three brand new dance pieces in response to the Titian paintings currently on display at the National Gallery’s Sainsbury Wing: Diana and Callisto depicting the moment where the chaste goddess is shocked to discover the pregnancy of the most beautiful of her nymphs, Callisto, Diana and Actaeon in which the young hunter intrudes upon the bathing Diana, and The Death of Actaeon where the hunter - turned into a stag by the revengeful goddess - is torn to pieces by his own hounds. The first work by Wayne McGregor and Kim Brandstrup, Machina, eschews narrative in favour of suggestion and minimalism. Extreme angular shapes by the dancers, a baroque-influenced score by Nico Muhly and a high-tech concept by artist Conrad Shawcross. Known for his structural and mechanical montages, Shawcross has distilled the essence of Titian’s main character in his “Diana-robot”. The machine takes centre stage, sometimes vulnerable, but mostly dominant: Diana as a huntress on the look out for her next target. In Trespass we see the symbols from Titian’s paintings come to life. Mark Wallinger has put his artistic focus on the crescent moon headdress worn by Diana in two of the paintings, as well as on the peculiar juxtaposition of Diana/Actaeon across Titian’s canvasses. Diana is goddess of the hunt but also of the moon, thus the idea of celestial bodies, the suggestion of man exploring and trespassing, with a nod to the Apollo mission. With a thrilling score by Mark-Anthony Turnage and a set that provides a 180-degree viewpoint for audiences (thanks to Wallinger’s giant curved mirror), Alastair Marriott and Christopher Wheeldon have created for dancers Sarah Lamb, Steven McRae, Beatriz Stix-Brunell, Nehemiah Kish and Melissa Hamilton solos and duos of exquisite shapes (spot the crescent moon-shaped lift) that often recall antique sculpture. Dance is an ideal medium for fleshing out emotion. While in Titian’s paintings we can only imagine Diana’s outrage at being discovered naked by the hunter Actaeon, on stage choreographers can attempt to translate those feelings into steps. Against the exotic and colourful landscape designed by Chris Ofili, Will Tuckett, Liam Scarlett and Jonathan Watkins examine the focal narrative point in Titian's work and explore this encounter between “Diana and Actaeon” from three different angles: surprise, outrage, anger, fear, threat and desire are suggested in the three pas de deux danced by Royal Ballet principals Marianela Nuñez and Federico Bonelli. These three works, brimming with creativity and personality have much to offer to art lovers. Machina might appeal to those who admire contemporary dance, Trespass has a distinctive neoclassical flavour, while Diana and Actaeon will appeal to story-ballet lovers. All in all, this is a wonderful opportunity to see a cross-collaborative project come alive, a unique event in the London 2012 Festival calendar. Metamorphosis: Titian 2012 runs until Friday 20 July at the Royal Opera House with the performance on 16 July screened around the country as part of BP Summer Big Screens. Emilia Spitz and Linda Uruchurtu write about ballet and dance at www.theballetbag.com. They have been named among the “100 Best Arts Tweeters” by The Times.